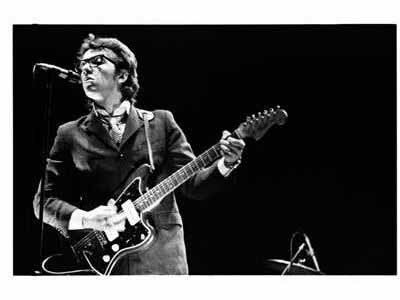 I’ve been lucky enough to see Elvis Costello in concert four times. Every one of the shows was simply amazing. 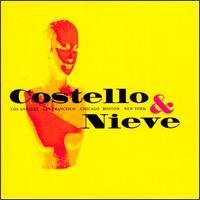 The first was on Halloween night, 1999, in Sunrise, Florida, and like the SOTD’s from yesterday and today, it featured just Costello on guitar and Steve Nieve on piano. The 39-song (!) set list is posted here and I believe it might have been submitted to that site by my cousin (though certainly there were other “Heathers” who attended the show). Song #39 on that list, ‘Couldn’t Call it Unexpected No. 4,’ was delivered “off mic” by Costello in one of the most intimate moments I’ve ever witnessed at a live concert. He was about ten feet away, belting out the song with no accompaniment. 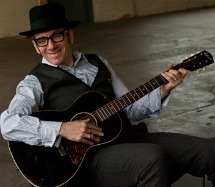 In 1996, Elvis Costello toured in support of his All This Useless Beauty album with a series of low-key shows featuring just him on acoustic guitar and his longtime keyboardist Steve Nieve on piano. 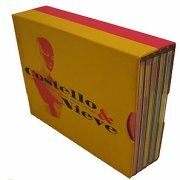 The same year, Costello released a limited edition box set compiling performances from five nights of that tour. Each 5- or 6-track CD contained recordings from one U.S. city: Los Angeles, San Francisco, Chicago, Boston and New York. It wasn’t the most fan-friendly packaging (each CD runs a little more than 20 minutes, meaning the whole thing could have fit on one or two discs) but it was a special collection. 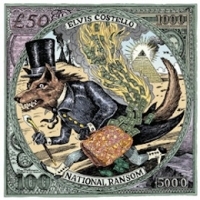 Here’s another of those acoustic demo tracks that stocked Elvis Costello’s CD reissues. ‘Running Out of Angles’ showed up among the bonus tracks of This Year’s Model. I have a very clear memory of listening to this song on a late night drive from my apartment to my wife’s office (which was just a mile or two from the house). She was working as a night cops reporter, meaning her hours were something like 3 p.m. to midnight, and I’d often stop by to meet her on her dinner break. I heard this song long before I heard it performed by Elvis Costello. In college, a friend’s band covered it in a very different arrangement (a little punk, a little Prince if I remember it correctly). At the time I wondered where the guy had dug up this obscure Elvis Costello song. I had all of Costello’s albums by then and considered myself a serious fan, so it was weird to hear “new” material. Today’s selection marks the end of the line for Elvis Costello’s studio album releases, but despite everybody’s assumptions yesterday, I’m not ready to shut down the Costello Weekends just yet. 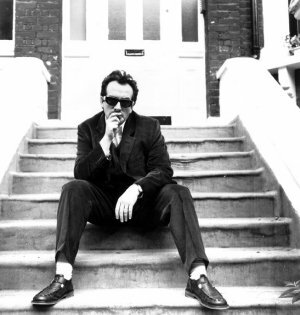 Over the next couple of weeks I will feature some of the many B-sides and alternate tracks that Costello has released over the years. Each of the CD reissues of his albums contains a treasure trove of material — songs that wound up as other songs in vastly different forms, covers, discarded tracks that are better than the album’s they were cut from, all sort of marvelous odds and ends. I’ll spend two weeks on those before retiring old Elvis and giving somebody else a shot. A mere six months and 24 albums after I started the Elvis Costello weekends, I arrive at the man’s most recent album. 2010’s National Ransom picked up where Secret, Profane and Sugarcane left off, using the same musicians, similar styles and even nearly identical cover art. But while the former album felt half-assed (by Elvis’ standards), National Ransom is a rich and resonant work — for my money, the most consistently great record he’s released since King of America. 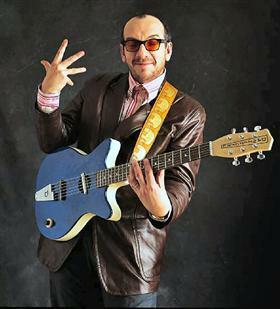 It’s funny that I’ve described Elvis Costello’s Secret, Profane and Sugarcane as “modest” and “minor” by his standards. Other songs on the album have similar introductory explainers: “A Dissatisfied Woman Fears Talking In Her Sleep,” “P.T. Barnum Reads An Abolitionist Pamphlet While Manufacturing Souvenirs Of The All-American Tour,” “Profane Adaptation Of Pious Song Performed By Acclaimed Nightingale,” you get the picture.